Dussehra Navaratri is one of the most important Hindu festivals that is celebrated for a continuous period of 9 days (actually 9 nights) from the next day of Mahalaya Amavasya. Mostly the festival falls in the months of Sept / Oct and is celebrated in different ways in different regions of India. In Tirumala, the annual Brahmotsavalu of Lord Venkateswara is celebrated during Dussehra. Malayappa Swamy - the Utsava Vigraham i.e the festival idol of Lord Venkateswara is placed in different Vahanas (vehicles) and is taken in a grand procession across the Mada Veedhulu i.e the temple streets. Tirumala is heavily crowded with devotees who throng from all over the world to witness the grand festival of Lord Venkateswara. Annual Brahmotsavam begins with Dhwajarohanam i.e the hoisting of Garudadhwajam which marks the beginning of the festival celebrations. In the evening, on the previous day of Dhwajarohana, Lord Viswakshena (Ganesha) along with his consorts Sootravati and Jayadevi, perform Bhoomipuja i.e worship Mother Earth. These are taken in a grand procession and enter the temple premises. On entering into the temple, Bhoomipuja is performed in the South-Western side of the temple and soil is then collected. In the night, Ankuraarpana for Brahmotsavalu is done with the sowing of 'navadhanyalu' (9 different types of cereals) in the collected soil. The entire festive celebrations is aired live on TTD's SVBC channel. Garudadhwajam (flag with an emblem of black Garuda - the celestial vehicle of Lord Vishnu) is hoisted at the Alaya Dhwaja Stambham. This event marks the beginning of Srivari Brahmotsavalu when Lord Venkateswara is taken in grand procession in the mornings and evenings in different vehicles i.e vahana on each of the 9 days during the Dussehra festival. Adiseshu is the Celestial 1000 hooded serpent that serves as mattress for Lord Vishnu. So the honor of serving / carrying the Lord during Brahmotsavam is conferred first upon Adiseshu. Malayappa Swamy - the Utsava Vigraham (idol) of Lord Venkateswara is seated on a gold plated vehicle shaped in the form of Adiseshu called Pedda Sesha Vahanam and is taken in a grand procession round the Mada Vedhulu i.e the main streets round the main temple. It is believed that Tirumala Hills are the manifestation of Adi Seshu and the aerial view of the 7 hills appear to be twined in the form of a serpent. It is believed that devotees who witness this seva / uregimpu i.e procession, will gain knowledge. Vasuki who is believed to be the younger brother of Adi Seshu, carries Malayappa Swamy which is known as Chinna Sesha Vahanam. Vasuki was used as a rope twined around Mt Manthan during the churning of Milky Ocean i.e Ksheera Sagara Mathanam. Chinna Sesha Vahanam is smaller than the Pedda Sesha Vahanam and is a silver plated one. The deities are taken to the Uyyala Mandapam for Unjala Seva. From here, Malayappa Swamy dressed as Goddess Saraswati is seated in the gold plated Hamsa Vahanam and taken in a grand procession round the Mada Veedhulu. The Sanskrit word 'Hamsa' means swan. It signifies purity as it capable of distinguishing good from bad i.e takes pure milk and discards the watery content. Devotees who witness the procession gain self-realization. Malayappa Swamy is taken in a grand procession on a gold plated lion shaped vehicle i.e Simha Vahanam. The ferocious lion is humbled down as a mewing cat in front of Lord Venkateswara. It signifies the equality of all creatures - no one is superior to the other - all His creatures are equal. Mutyapu Pandiri is a spectacular procession. The Telugu word 'Mutyam' means pearl and 'Pandiri' means canopy. After Unjala Seva, Malayappa Swamy accompanied with His consorts - Sridevi and Bhoodevi - is carried in a canopy beautifully decorated with original pearls. The beauty of pearl canopy is doubled in the dazzlingly illuminated night at Tirumala. The spectacular procession is worth watching and it gives a feeling of pureness as pearls symbolize purity. Devotees get mesmerized on witnessing the procession of Mutyapu Pandiri. In Hinduism, Kalpa Vriksham is believed to be the celestial tree that fulfills one's wishes. Malayappa Swamy is taken in a grand procession seated in the gold plated vehicle that is designed in the shape of Kalpa Vriksham. Devotees believe that all their wishes will be fulfilled on watching the procession. Sri Hari i.e Lord Venkateswara is believed to be the Lord of the Universe. All the kings / emperors on the Earth (sarva bhoopala) are transformed into vehicle to carry the Lord of the Universe. This signifies the supremacy of God over all beings. On this special day, Malayappa Swamy is dressed as Mohini and is taken in a procession in an ivory palanquin (pallaki). Lord Vishnu took the form of a beautiful lady named Mohini to get back the divine nectar (Amritham) from the demons (danavasa) when it was extracted from the depths of the ocean during ksheerasagara madhanam i.e churning of the milky ocean. The idol of Lord Krishna with butter in hand is also seated in the palanquin. This particular procession directly starts from the temple. Garuda is the Divine Eagle and the vehicle of Lord Vishnu. His service to the Lord is commendable. Hence He is honored to serve Malayappa Swamy during annual Brahmotsavam by carrying Him. The vehicle is designed in the shape of Garuda. Lord Hanuman known for His selfless service to Lord Rama and His surrendered devotion to the Lord. No one can replace His devotion. Hence Hanuman, in the form of vehicle, is honored to carry Malayappa Swamy on His shoulders. Later Malayappa Swamy is placed in a Gold Chariot (Swarna Ratham) and is taken in a procession. After Vasantotsavam (i.e colorful spring festival) celebration in Unjala Mandapam, the festival deities are mounted on a gold elephant shaped vehicle. 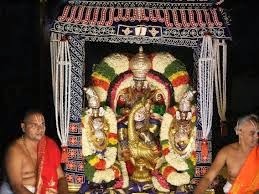 The Lord on Gaja Vahanam is then taken in a grand procession round the Mada Veedhulu. Elephant has a special place in Hindu temples and it is considered height of glory when mounted on an elephant. Sun (i.e Surya) is considered 'Pratyaksha Daivam' i.e the Visible God who is the ultimate source of energy on Earth. Malayappa Swamy with a Gold Aura ('Prabha' is the Telugu word for 'aura') behind His head is taken on a ride in a gold plated Sun chariot driven by 7 gold horses. After Unjala Seva, the deities are taken on a procession in the moon-shaped chariot round the four streets. Malayappa Swamy with a Silver Aura behind His head is seated in the Chandra Prabha Vahanam. Malayappa Swamy is taken in a grand procession in a beautifully decorated gold chariot i.e ratham. The devotees get an opportunity to serve the Lord by pulling the chariot when the entire area reverberates with the chant 'Govinda Govinda'! On the last day of Brahmotsavam, Malayappa Swamy is taken out on a grand procession in the Mada Veedhulu in a chariot with gold horse (ashwam) pulling the vehicle. Horses symbolize great strength and energy. The Telugu word 'Pallaki' means 'palanquin'. On the final festive day morning, the festival deities are carried in a decorated Palanquin. Chakrasnanam is the event on the final day of Srivari Brahmotsavam. Abhishekam is performed to Malayappa Swamy along with both His consorts and with Chakratthaalwar i.e Sudarsana Chakram (the divine disc of Lord Vishnu), at Varaha Swamy temple near Pushkarini i.e the Holy Tank. These idols are then dipped or given a bath in the Pushkarini (lake) waters. After the events / sevas to Srivaru (Lord) for 9 continuous days in the mornings and evenings, Srivari Brahmotsavalu culminates on 10th day night with Dhwajaavarohana in the night which marks the end of Brahmotsavalu - the festive celebrations at Tirumala. Tirumala is heavily crowded with devotees from all corners of the country. Many dance troupes from different regions of the country perform regional dances in the Thiru Mada Veedhulu and show their devotion to the Lord.